Takayasu's aorto-arteritis (TA) is a chronic, autoimmune, granulomatous, and inflammatory disease of the aorta and its major branches at their origin, which results in dilatation, occlusion, stenosis, and/or aneurysm formation of the affected arteries. Classical inflammatory markers, such as erythrocyte sedimentation rate (ESR) and C-reactive protein (CRP), reflect the inflammatory processes in most cases of untreated TA. Percutaneous transluminal balloon angioplasty in children is highly effective and safe in relieving stenosis of the aorta due to aortic arteritis, with marked clinical improvement. Fortunately, arterial dissection is a rare, life-threatening complication. We describe a case of a 6-year-old female child with overtly inactive TA, who underwent balloon angioplasty for severe coarctation of the thoraco-abdominal aorta (CoA) resulting in an aortic dissection. An emergency coarctation stenting was successfully undertaken to salvage the grave situation. Our patient was a 6-year-old female child admitted with complaints of severe headache, recurrent vomiting, and breathlessness on exertion (New York Heart Association-2) for about 2 months before admission. An echocardiogram done outside had revealed cardiomegaly with mild to moderate dysfunction, for which oral corticosteroids had been started (indication not known) for about 6 weeks and then stopped arbitrarily 1 week before admission since she had partial relief in her symptoms. She was subsequently referred to our hospital for further workup and specialized care. On admission, she was found to have severe upper limb hypertension (blood pressure 174/116 mmHg in the right upper limb) but completely absent lower limb pulses and no bruit. 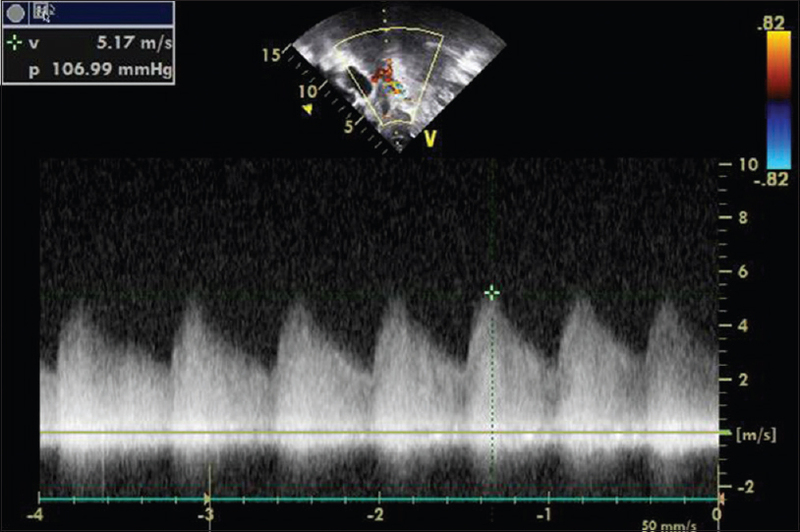 Repeat echocardiography at our center revealed a severe coarctation of the thoracoabdominal aorta (gradient 107 mmHg) with diastolic tailing and a dilated, hypertrophied, and dysfunctional left ventricle (LV) with a left ventricular ejection fraction (LVEF) of 40% [Figure 1]. 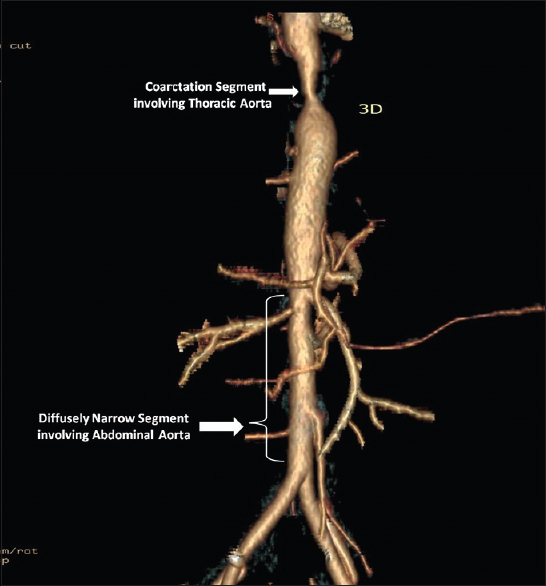 Computed tomography angiography revealed luminal narrowing involving thoracic and abdominal aorta with stenosis of right renal artery ostium suggestive of inflammatory pathology [Figure 2]. Her blood workup revealed that total leukocyte count, CRP, rheumatoid factor, antinuclear antibody, von Willebrand factor, complement C3, C4, p-ANCA, and c-ANCA were all within normal limits. Erythrocyte sedimantation rate ESR was 22 mm/1 h. Rheumatology consultation was sought, and she was diagnosed as a case of TA  and oral prednisolone was restarted. Since multiple antihypertensives failed to control her blood pressure and LV was dysfunctional, a palliative balloon angioplasty was planned with subsequent stenting of the lesion at a later date, preferably after the child attains the age of at least 9 years. As all markers of disease activity were negative and steroid cover had already been started 1 week before the procedure, it was assumed that the disease was not active and the procedure could now be undertaken safely. The patient was taken up for ballooning of coarctation, and endovascular stent grafts were kept on available for any untoward events. Descending aorta angiograms in the anteroposterior and lateral views revealed a coarctation segment at D7–D8 level measuring about 4 mm × 3 cm with diffuse luminal narrowing from celiac branch onward till iliac bifurcation with a relatively smaller but patent right renal artery [Figure 3]a. The descending aorta at the level of the diaphragm measured 12 mm. A low-profile, low-pressure, and slightly undersized 10 mm × 3 cm Tyshak balloon was inflated in the diseased segment until disappearance of waist could be demonstrated. 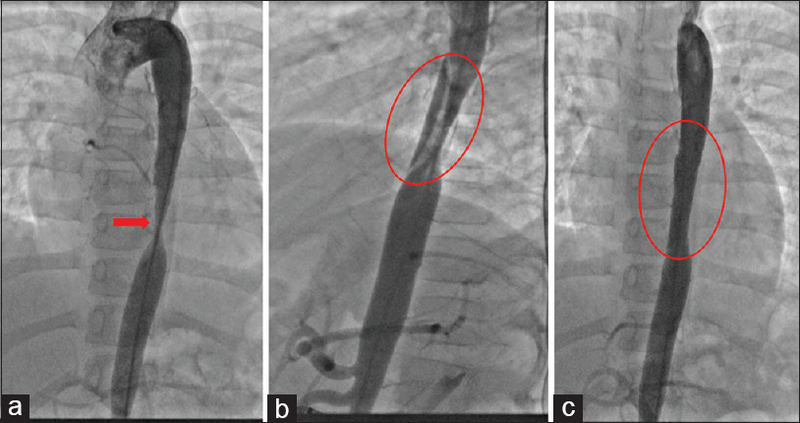 A check angiogram revealed an axial dissection at the site of ballooning [Figure 3]b, and hence, a self-expanding bare-metal stent (epic Boston scientific 12 mm × 60 mm × 120 cm) was immediately placed in situ through a 10F delivery sheath. Postprocedure angiogram revealed a well-placed stent in situ and an opened coarctation segment with no significant gradient across the stented segment. There was no extravascular leakage of contrast in the dissected segment [Figure 3]c. The pulses in the lower body became palpable immediately postprocedure, and since her blood pressure returned to normal limits, her antihypertensive medication could also be tapered in the following days, but oral corticosteroid therapy was continued. A follow up echocardiogram after 1 month revealed no significant gradient in the descending aorta with an improvement in LVEF to 50%. She was asymptomatic and normotensive. The rheumatologist is planning to place her on appropriate immunosuppressive therapy subsequently. This case demonstrates the perils of an otherwise relatively simple procedure of ballooning of CoA in children with aorto-arteritis like TA. Even when the diagnosis is secured, challenges occur in distinguishing between the acute or “active” phase of the illness and the chronic, stenotic phase. Revascularization procedures may be safely performed during the inactive phase of TA. It has been shown that vascular complications are more likely to occur when biological inflammation (raised ESR and CRP) is present at the time of the vascular revascularization, regardless of the modality of treatment. In our case, as the markers for disease activity were normal with significant attenuation of symptoms and an adequate corticosteroid cover had been provided well in advance of the procedure, it was wrongly assumed that active inflammation was unlikely to be present. Isolated case reports have illustrated that children with TA and extensive negative investigations did indeed have an on-going active large vessel vasculitis, which was diagnosed on post-mortem examination following a fatal outcome revealed on postmortem. It is essential that one does not rely on acute phase reactants alone but uses a combination of clinical examination, assessment of patient symptoms and imaging studies to exclude progressive arterial injury. Percutaneous transluminal balloon angioplasty for stenosis of the aorta appears to be remarkably safe, keeping in mind that the stenotic lesions in TA can be very rigid and require a higher inflation pressure for effective dilation. Nonetheless, aortoplasty should only be undertaken only after appropriate size stent grafts are available on shelf. We used a low-profile, low-pressure, and slightly undersized balloon with gentle hand inflation and yet ended up causing a dissection. Fortunately, when faced with this grim situation, endovascular stents kept as standby in our inventory helped us tide over the emergent crisis. One needs to be aware of these limitations and challenges if we are to strive for better outcomes in these lesions. In patients with aorto-arteritis like TA, negative inflammatory markers with adequate steroid cover do not ensure that the disease is inactive or benign. Angioplasty should be attempted with great caution using low-profile, low-pressure balloons and with appropriate endovascular stents on standby to meet any unexpected exigency. These particular lesions appear to be high risk for complications such as dissection or rupture and perhaps even death. Ozen S, Ruperto N, Dillon MJ, Bagga A, Barron K, Davin JC, et al. EULAR/PReS endorsed consensus criteria for the classification of childhood vasculitides. Ann Rheum Dis 2006;65:936-41. Salvarani C, Cantini F, Boiardi L, Hunder GG. Laboratory investigations useful in giant cell arteritis and Takayasu's arteritis. Clin Exp Rheumatol 2003;21:S23-8. Tyagi S, Khan AA, Kaul UA, Arora R. Percutaneous transluminal angioplasty for stenosis of the aorta due to aortic arteritis in children. Pediatr Cardiol 1999;20:404-10. Civilibal M, Sever L, Numan F, Altun G, Ocak S, Candan C, et al. Dissection of the abdominal aorta in a child with Takayasu's arteritis. Acta Radiol 2008;49:101-4. Maksimowicz-McKinnon K, Clark TM, Hoffman GS. Limitations of therapy and a guarded prognosis in an American cohort of Takayasu arteritis patients. Arthritis Rheum 2007;56:1000-9. Keser G, Direskeneli H, Aksu K. Management of Takayasu arteritis: A systematic review. Rheumatology (Oxford) 2014;53:793-801. Saadoun D, Lambert M, Mirault T, Resche-Rigon M, Koskas F, Cluzel P, et al. Retrospective analysis of surgery versus endovascular intervention in Takayasu arteritis: A multicenter experience. Circulation 2012;125:813-9. Watson L, Brogan P, Peart I, Landes C, Barnes N, Cleary G, et al. Diagnosis and assessment of disease activity in Takayasu arteritis: A childhood case illustrating the challenge. Case Rep Rheumatol 2014;2014:603171. Tyagi S, Kaul UA, Nair M, Sethi KK, Arora R, Khalilullah M, et al. Balloon angioplasty of the aorta in Takayasu's arteritis: Initial and long-term results. Am Heart J 1992;124:876-82. Hijazi ZM. Catheter intervention for adult aortic coarctation: Be very careful! Catheter Cardiovasc Interv 2003;59:536-7.